WAIST HIGH: Happy 25th Birthday "Belly Of The Whale." Happy 25th Birthday "Belly Of The Whale." One of the great songs of 1983, "Belly of the Whale" received heavy rotation on MTV and became one of their top 10 videos during their fledgling start up period, and yet the song may have been more beloved on the west coast thanks in kind to Waist High and to massive play on Pasadena's KROQ. 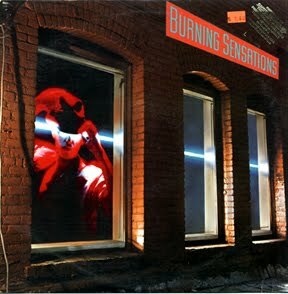 The short lived Los Angeles band Burning Sensations was formed in 1982 and disbanded in 1987. After departing The Motels, Tim McGovern formed one of the first "world beat bands," whose discography was brief. Burning Sensations released Belly of the Whale, Burning Sensations, and was featured on the Repo Man Soundtrack in 1984. Of "Belly of the Whale," Andrew Chalfen had this to say: "The calypso/Latin infusion, the gentle digital reverbed synths and guitars floating out over the bay where the sea and sky melt together in a silvery thrum, the big-fish story of the lyric, it's all there, man." He also added that "Belly of the Whale" features "amazing sounds, melody lines, and hooks, and an absolutely killer chorus." Call me biased, but "Belly of the Whale" really is one of the greater tunes to come out of the much hated new wave genre. Tim McGovern is currently fronting the Pacific Northwest band Knucklehead, and if you click here and scroll to the playlist you can hear their cover version of the song.